THE LOOK: is simple enough for everyday wear and may even be work appropriate (depending on your job, of course)... I don't know how suitable it is for Nurse Larry, but I'm sure she'll make it work as she always does. To play down the makeup, you can simply eliminate the bright purple shadow or just use it as an accent at the outer corner. TO ACHIEVE: I started with my regular foundation routine using mineral makeup products, as always. If you're curious about what I use, go to any of my previous entries--all the details are posted there. For this post, I'll just focus on the eye makeup. 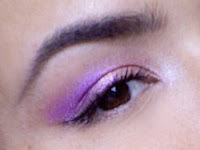 THE EYE MAKEUP: For this look, I used three shadows from this Urban Decay palette: Scratch (shimmery dusty pink) for the lid, Fishnet (bright duo-tone purple) for the outer crease, and Underground (shimmery taupe) for the outer corner. I used four different brushes for the application of the product and I'll provide links for each. Prime your lids with a primer. 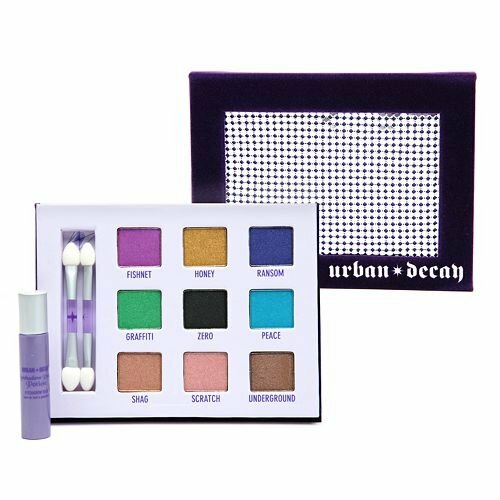 This palette comes with a mini primer potion. 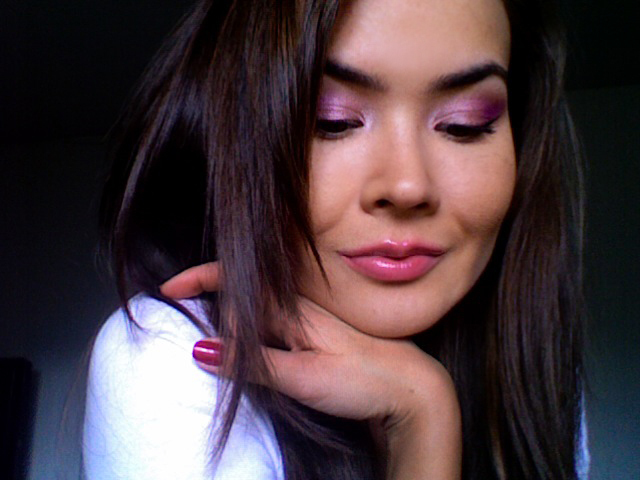 Apply a sticky base (NYX jumbo eye pencil in oyster ) all over the lid and above the crease. This step is optional but will help your shimmery shadows stick. Take a flat shader brush and apply Scratch all over the lid, using patting motions. Take a tapered fluffy blush and apply Fishnet to the outer crease and above, blending the color in, using windshield wiper motions. 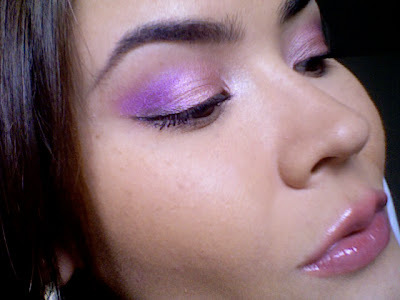 With a clean dome shaped brush, blend out the edges of the bright purple (fishnet) to soften the harsh line. If you've removed some of the color in the process, repeat the previous step. 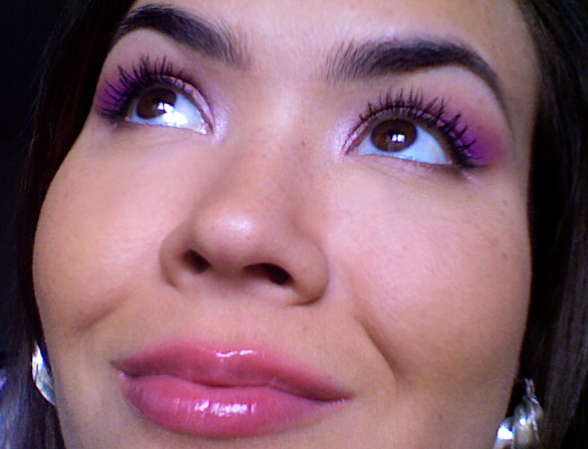 Take a pencil brush and apply some Underground to the outer top and bottom lash lines. 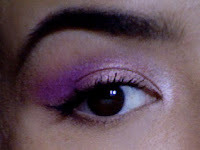 Use a gel liner to line the outer third of your top lash line and extend the wing, "outlining" the purple shadow. Curl your lashes and apply two coats of mascara to the top lashes. 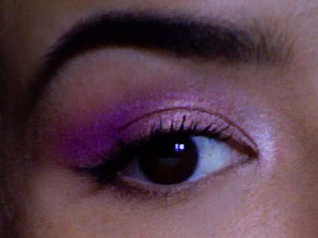 Add any shimmery white shadow (not in the palette) to the inner corner of your eye for an extra pop. I usually do this with my pinky finger. 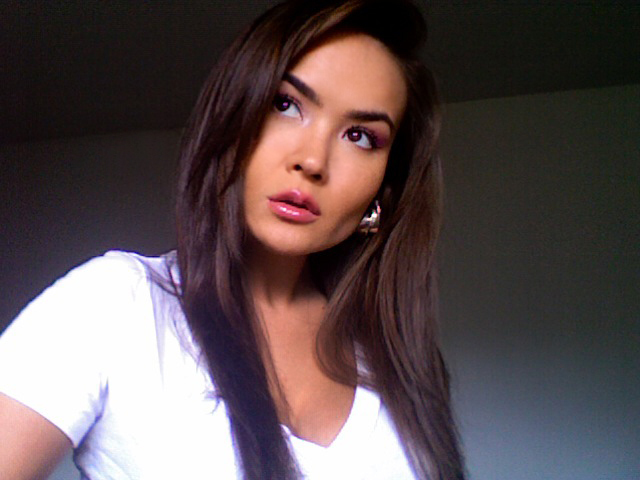 I'm not sure I like this pic... do you? 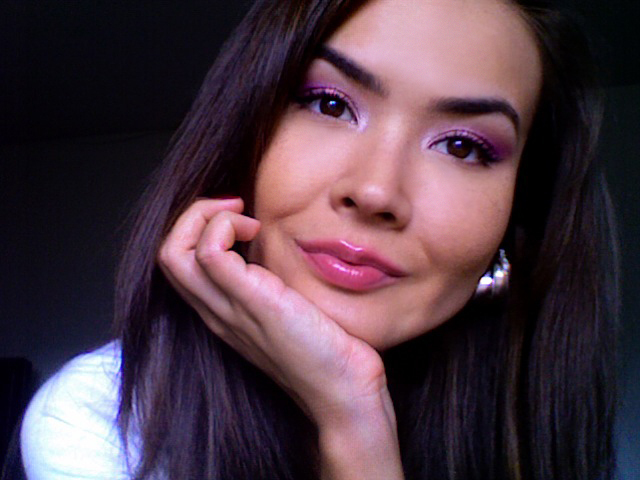 MAKEUP TIP: Another makeup suggestion is to pair bright makeup/shadows with light clothing (for everyday wear), like I did in the pic above :) People often ask me about how to match makeup to clothing, and although I usually don't dwell on it much, I tend to stick to this basic rule: NEVER MATCH YOUR EYESHADOW TO YOUR CLOTHES. Instead, try to find a complementary color combo, or if you must match, choose a shade in the same color family. Remember, makeup is meant to enhance, so if you're already wearing something embellished or bright, this is your opportunity to keep the makeup simple. Stick to neutral colors to warm up and brighten your skin tone. When wearing bright makeup, keep in mind that it is best worn with black, white or solid colors.